From the Star Wars collection by Body Vibe. Star Wars Episode VII - The Force Awakens Red X ID Leather Bracelet. From the Star Wars collection by Body Vibe. 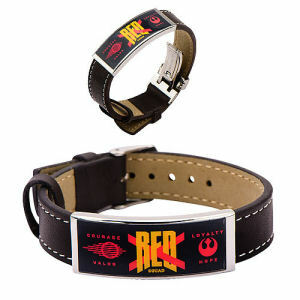 Star Wars Episode VII - The Force Awakens Red X ID Leather Bracelet. Made of leather and stainless steel. Measures .5 inches wide. Body Vibe Star Wars Attire shipping from Canada. No Surprise Border fees or Customs!